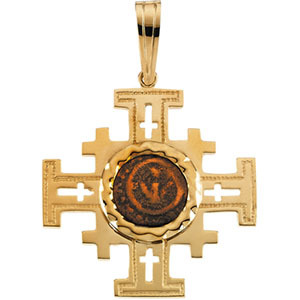 This special pendant below, holds a "widow's mite", an excavated coin, in use in first century Palestine, immortalized by Jesus' words about the generous widow" Jesus looked up an saw the rich putting their gifts into the trasury and he saw a poor widow put in two copper coins (mites). And he said, "Truly I tell you, this poor widow has put in more than all the others; they gave from their surplus, but she put in all that she had to live on." Luke 21:1-4. 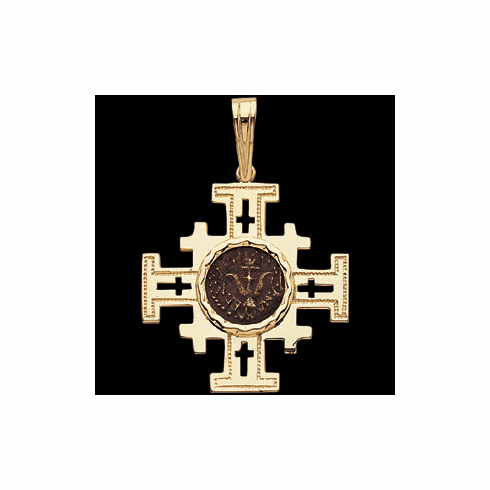 A 14k gold Jerusalem Cross pendant with a genuine widow's mite coin in the center. The pendant measures 31.25 x 31.75.